This is a special ticket. It belongs to the first "racer" coaster. Racers have two parallel tracks that run at the same time, allowing riders to race each other. It's both exciting and makes economic sense by doubling rider throughput on roughly the same footprint as a traditional single-track coaster. Located next to Sea Beach Palace and the Elephant Hotel (later the site of Luna Park), Merrill's Racer must have been a good ride to have survived for so long on such prime property. The ride is referenced as far back as June 1895, when a 30-year old Joseph Lilly, filled with liquid courage, decided halfway through the ride that he'd ride the rest of it standing up. This dubious idea resulted in Lilly falling 30 feet and landing by the Elephant, "crushing his skull" in the process. (Newspapers couldn't get enough of the gory details back then.) Witnesses pretended to be horrified - and maybe a few actually were, including his four companions - but the next group boarded right away and the Racer didn't skip a beat. 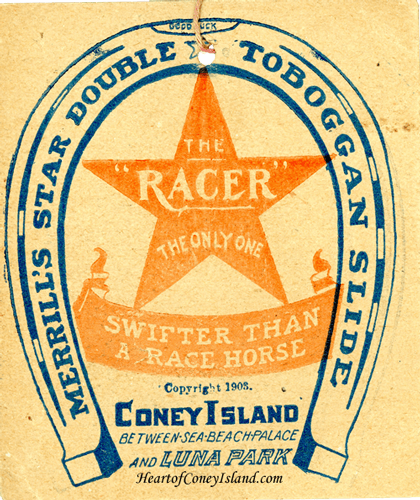 This ride may originally have just been a single track, because accounts of it as late as 1898 refer to it as "Merrill's Toboggan" and not specifically as a racer. 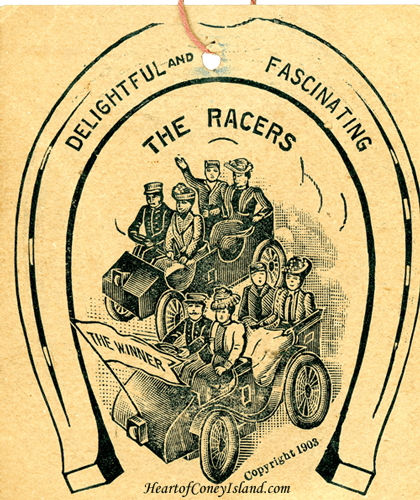 It definitely was a racer by September 1903. Sadly, Ezra Merrill died in May 1899 shortly after a coaster car rolled back onto him as he was connecting cars. A successful entrepreneur, Merrill had sold his sawmill business to partner up with Stephen Jackman in the roller coaster business. 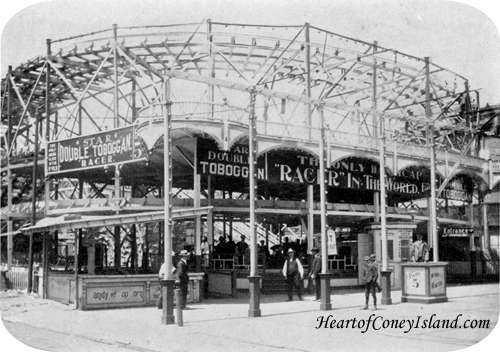 They had multiple roller coasters, chutes and rides in Coney Island.